Since 1909, the Paris Air Show has served as a showcase where the newest military-, commercial- and general-aviation aircraft make their international debuts. And for years, organizers have been hungry to feature the F-35 Lighting II, a game-changing Lockheed Martin jet that promises to transform air combat with its stealth and sophisticated sensor and networking capabilities. 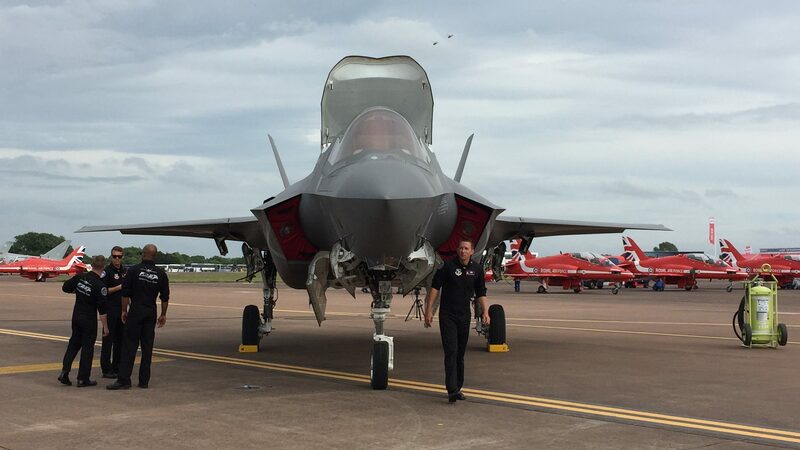 The jet was to have made its Le Bourget debut in 2015, but those plans were derailed after an engine fire just before the 2014 Farnborough International Airshow kept the F-35 from its maiden international outing in the UK. Given Britain and the United States are the only Tier 1 partners on the program, it was fitting that the F-35’s first overseas trip be in the UK. And when the Lightning made it to Britain in 2015, it simply wowed audiences at the Royal International Air Tattoo, and again the following year at both RIAT and Farnborough. French officials understood the decision and were told that, come 2017, the F-35 would grace the sky over one of the world’s most historic airfields. But just last week, US officials suggested that the jet wasn’t going to Paris. Excuses have abounded. The French never asked for the jet to appear over Paris. With the air show starting on June 19, there isn’t enough time to make it happen. Sequestration forced the US Air Force to disband its F-35 demonstration team. Lockheed Martin, the jet’s builder, didn’t have pilots available. The program, which is already behind schedule and overbudget, didn’t have jets available for something as frivolous as an airshow. With President Trump focused on cutting the cost of the program, a Paris debut might prove politically dicey. And who would bear the costs of demonstration flights? Now, officials hint the jet may make the trip after all. That’s good news given none of these are good reasons to keep the F-35 from the world’s most prestigious air show. For years, American officials and industry executives have met repeatedly with their French counterparts to discuss the F-35 at Paris. Those discussions have been ongoing as French officials are eager to showcase the new US jet – in US colors – at their flagship airshow. Le Bourget’s hunger for the F-35 is two-fold. First, the program is, quite literally, the biggest single defense program ever to produce a technological and aeronautical marvel. Second, such a small number of new military aircraft are under development that debuts are few and far between. The F-35 is a new jet that the world has read about for two decades; now that it’s flying, people want to see it in person. Yes, skilled demonstration pilots are necessary to fly a full airshow display, but not a flyover. In fact, US combat aircraft have often overflown the airshow. And there are US jets based at RAF Lakenheath, 250 miles from Le Bourget. If the planes can’t spend a few days flying from the historic French airfield, they could make daily appearances flying from Lakenheath. It’s important that the F-35, at the very least, makes an appearance at Le Bourget. France is a close ally of the United States that has patiently and understandingly waited its turn to host the F-35, acknowledging that partner nations should get preferential treatment. There is also a good economic reason to take the jet to France. The F-35 is the world’s most advanced fighter, developed by an unprecedented number of global partners. Those partners will all be at Le Bourget, and nothing drums up interest like a thundering new jet bringing the show to a standstill. Thanks to the focused work of thousands worldwide – under the leadership of its exemplary program manager Lt. Gen. Chris Bodgan – the price of the F-35 is trending down. That means more nations are considering the F-35 as their next fighter. If the Trump administration really wants to make good its promise to boost American prestige and advance the nation’s industrial interests, then making sure the F-35 struts its stuff in Paris should be a priority. With the air show just weeks away,the sooner the decision is made, the better.